My thanks to John Whitehead who provided many of the pictures used on this page. 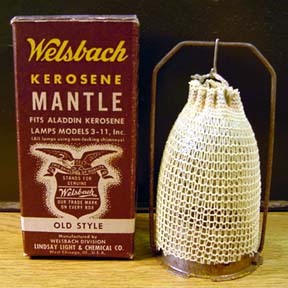 Unmounted mantles were used in several early brands of Mantle lamps. The best known to Aladdin enthusiasts are the Practicus burners. They were also used more recently on burners like the Eugeos (manufactured by Ehrich & Graetz), the Coleman Ker-O-Lite and Candesco burners. 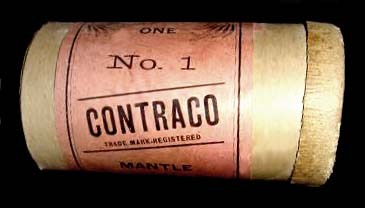 The mantle shown below was sold by the Connecticut Trading Company (CONTRACO) for the early Practicus burner. Unmounted mantles for the Candesco burner used in the 1930's. 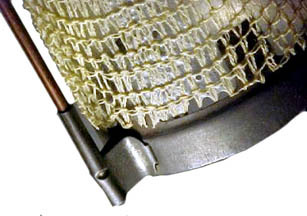 The Cap mantle used with the Aladdin model 1 & 2 were a vast improvement of the earlier adjustable hang man shape hanger The mantle now came premounted on an inverted U shaped frame that is attached to a base. The base slid down over the cone in the gallery providing much better centering of the cone and minimized hand contact with the mantle fabric. 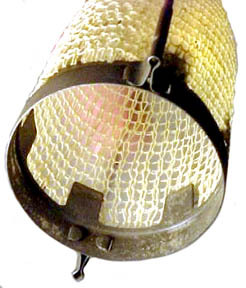 Cap mantles were also used on Beacon model 1, Kim, Sunlight, early Sunbeam burners and late CONTRACO burners among others. 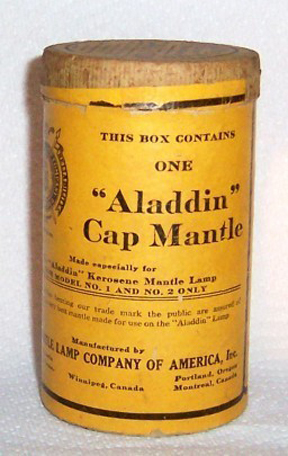 Aladdin Cap mantles were sold in white or uncolored (bare cardboard) boxes with blue print. 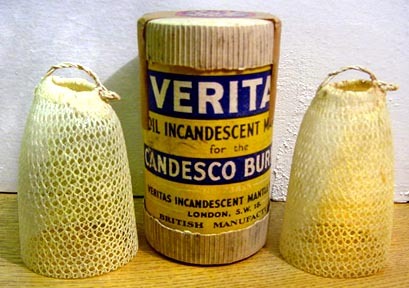 Early mantles were sold in round boxes and later ones in rectangular boxes. I am not sure when production of the cap mantle ended. It appears in the 1922 price list and is absent when the lox-on mantles were introduced in 1928. If Any one can help narrow down the year cap mantles were discontinued I would appreciate an email. Also if you have any idea of when Aladdin went from the round box to the rectangular box. 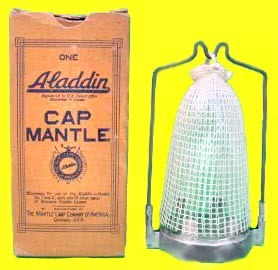 Aladdin Cap mantle and early style round box often referred to as a "can". I think this is the last box style used for the cap mantle before they were discontinued. 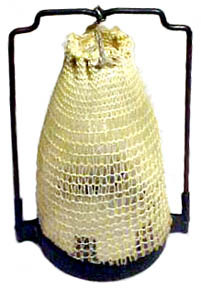 The Aladdin Cap mantle shown above appears to be a hybrid of a cap mantle base with a newish wire frame and bag attached. Cap mantles were discontinued in the mid 1920's and most collectors consider the few surviving unburned examples to be to rare and too valuable to burn. The solution is to remove the support wire off a used cap mantle frame and fit a new wire support and new mantle bag to the Cap mantle base. 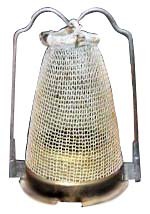 This allows you to burn model 1 and 2 lamps at the cost of modern mantles. Of course you need to find an old cap mantle base first. The Aladdin KoneKap mantle eliminated the problem of aligning the mantle correctly with the gallery cone by moving the cone from the gallery to the mantle frame. This insured correct alignment and was a vast improvement on earlier mantle mounting methods. 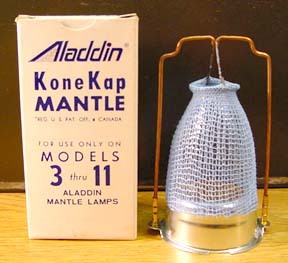 KoneKap mantles were used on Aladdin lamps from late model 2 (with model 3 gallery) through model 11 and were discontinued around 2000. 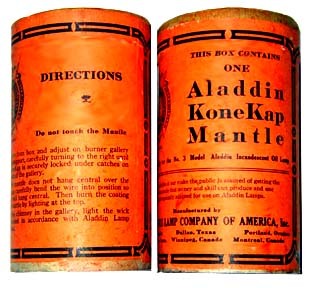 The KoneKap mantle introduced for the model 3 lamp came packaged in a cardboard cylinder that was orange in colour. 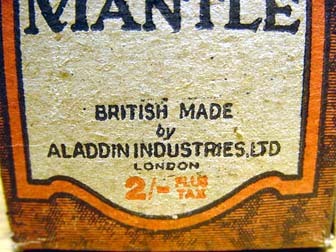 This strongly contrasted with the white packaging used for Aladdin Cap mantles. This sharp contrast in packaging was likely to keep people from confusing the two and saved possible damage from people opening boxes to see which was which. Instruction label on the side of the box reads: "Do not touch mantle. Remove from box and adjust on burner gallery by wire support, carefully turning to the right until the KoneKap is securely locked under catches on each side of the gallery." "If the mantle does not hang central over the KoneKap, carefully bend the wire into position so mantle will hang central. Then burn the coating off mantle by lighting the top. Replace chimney in the gallery, light the wick and proceed in accordance with Aladdin Lamp directions"
Note that all later package labeling said to light the mantle from the bottom. Box bottom, top and top with lid and cotton removed. First Kone-Kap mantle style. Instruction label on top of box reads "Caution Cut the label at the lower edge of the cover . Pick off the cotton very carefully, then remove the paper tray and pull mantle from can by taking hold of the wire support. 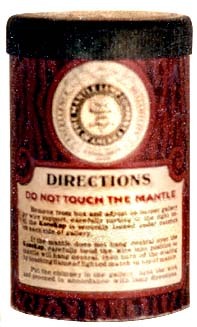 Do not touch mantle or allow it to touch the sides of the can. 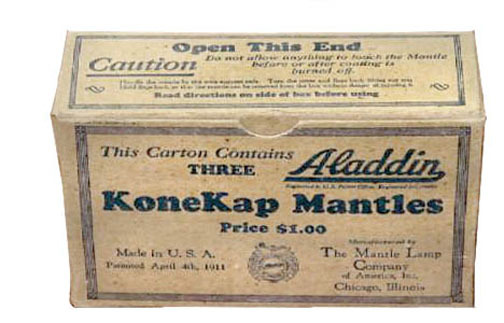 Read the directions on the side of the can before using"
Presumably starting with the Aladdin model 4, KoneKap mantles were packaged in mahogany colored boxes with a simulated wood grain. 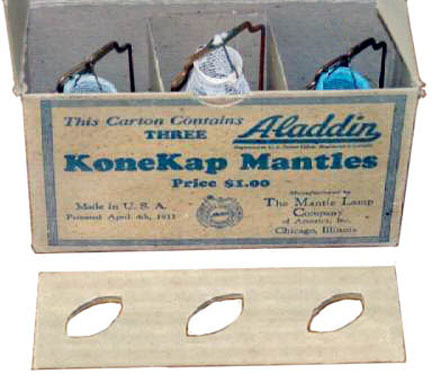 Early KoneKap mantles were still packaged in round boxes then later in rectangular boxes. 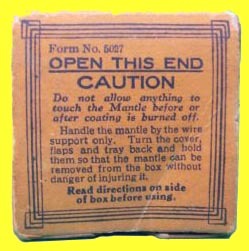 Instructions on top of box " Do Not Touch Mantle CAUTION"
"Remove the cover and pick off the cotton very carefully, then remove the paper tray and pull mantle from the can by taking hold of the wire support. 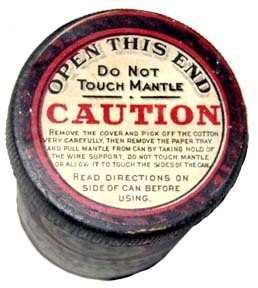 Do not touch mantle or allow it to touch the sides of the can." 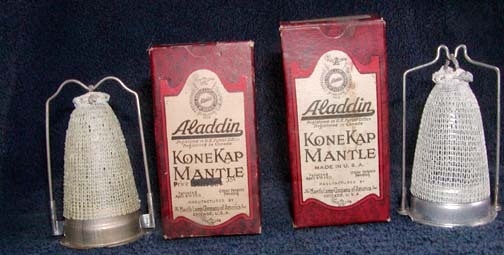 "Read directions on the side of the can before using"
The rectangular boxes were likely introduced with the Aladdin model 6 lamp and came in at least two heights. The earlier one is 4 inches tall and the later one 4-1/4 inches high. The rectangular box allowed a cardboard top mantle frame support that did not require a wad of cotton to keep it in place. The KoneKap mantle on the left is earlier than the one on the right. Note the original frame style was still was used in early rectangular boxes. The best I have been able to date the Aladdin mantles pictured above so far is between 1915 and 1932. The box on the left is 4 inches tall. The one on the right is 4-1/4 inches tall which is the same height as the later red and black boxes. Note the frame mount at the base of the cones. I believe the one on the left is the original mounting style but the frame rod is the second frame style. 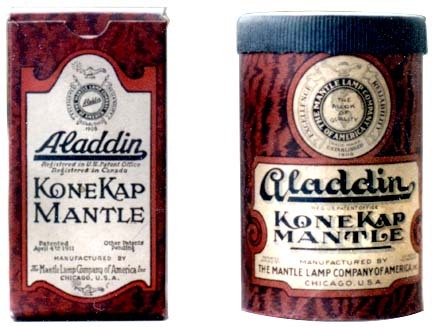 This Aladdin KoneKap mantle is the same as the later version pictured above and is in a different mahogany box. As best as I can tell this mantle dates between 1932 and 1946. I think it most likely to be a 1930's box. 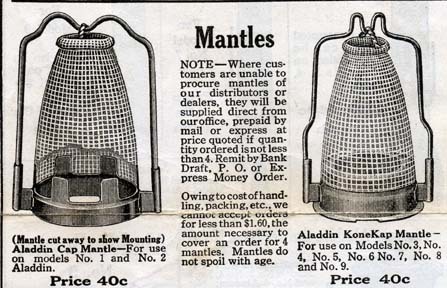 These are a pair of UK KoneKap mantles. 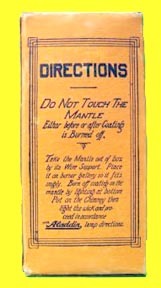 The mantle construction appears to be the same but the box labeling has changed. 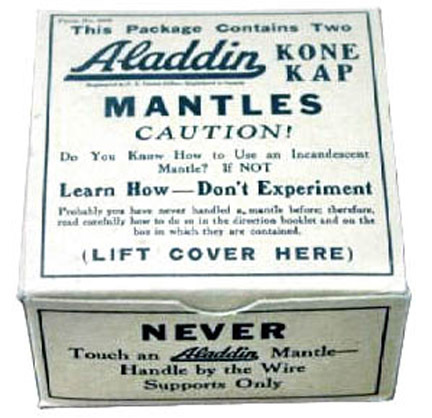 These Aladdin mantles were manufactured sometime between 1919 and 1940. I'm guessing that the one on the left is the older of the two since the packaging on the right was used both before and after 1940. 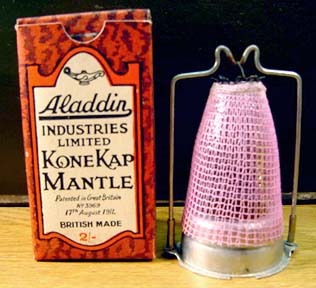 According to John Whitehead two different quality levels of KoneKap mantles were sold in the UK. The ones with pink mantles, like those shown above, were the high quality version. Ones with white mantles were less expensive economy versions. According to John, the purchase tax was introduced in 1940. So prices printed after that date have "Plus Tax" added to the back of the price. That makes the picture to the right to be a 1940 or newer UK mahogany KoneKap Mantle box. 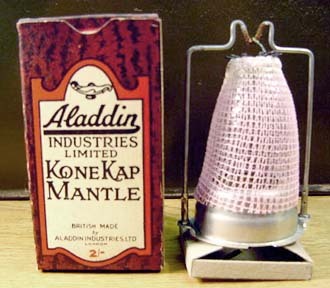 The first of the non-mahogany Aladdin KoneKap mantle boxes. Printed on the side is a 1938 patent date. On some boxes the label states "New Design 1936" The box design was apparently discontinued in 1946. 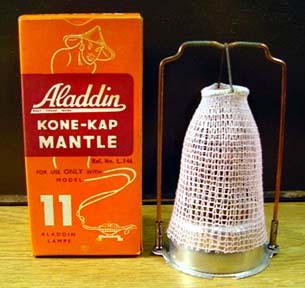 This Aladdin UK KoneKap mantle dates from sometime between 1946 and 1964. I strongly suspect it is much closer to the 1964 date. Once again any help with dating the packaging would be appreciated. 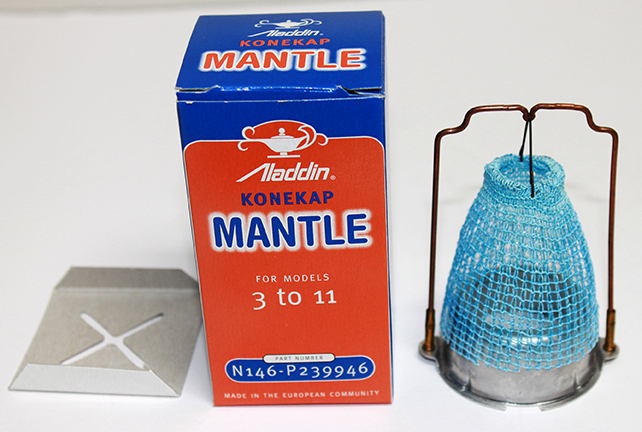 Notice that Aladdin UK marketing did not think it worth mentioning UK model 8, 9 & 10 lamps. I suspect this is because they were sold in much smaller numbers than the UK model 11. The logo on the packaging dates this mantle in the 1970 and newer. These mantles are made in Brazil and were the last Aladdin KoneKap mantles. 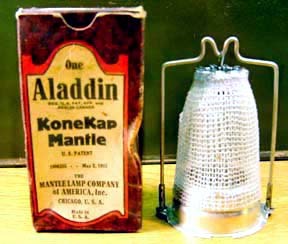 Production of Aladdin KoneKap mantles ceased in 2007. The factory stock ran out in late 2009. "This KoneKap mantle was made by Falks Veritas in Malta during the 5-6 years the mantles were made there after Brazil Production shut down"
In 2012 Aladdin introduced an adapter that fits onto a model 3 through 11 gallery that allows the use of a Lox-On mantle with the earlier lamps. 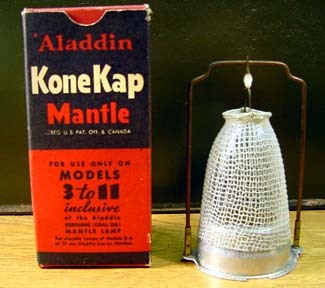 At one time you could purchase Aladdin Kone Kap mantles packaged in pairs and in a three pack. The boxes are dated 1911. 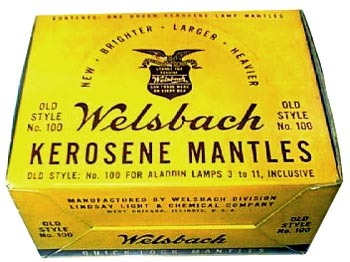 Welsbach was a popular aftermarket manufacturer of mantles for both the Aladdin KoneKap and Lox-On styles. The labeling indicates this was manufactured sometime after 1928.